Spacious, elegant, contemporary-style rooms in the main building. 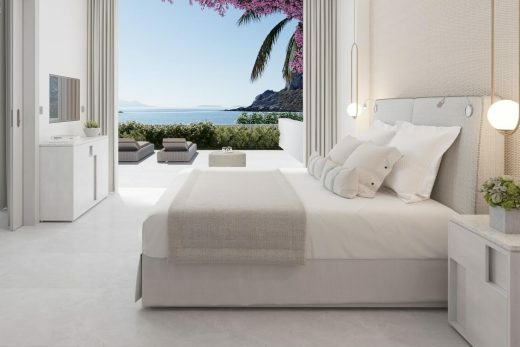 Panoramic windows and a furnished private balcony deliver stunning views of the beach and Aegean Sea, or overlook the beautifully landscaped gardens. 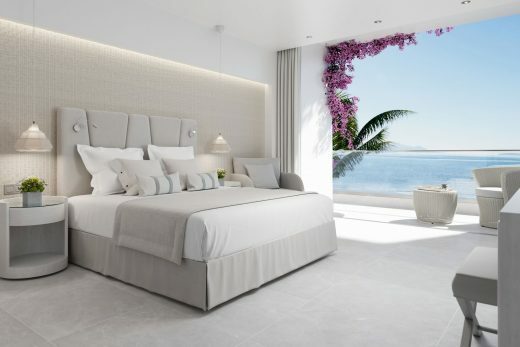 The elegant interior of these spacious rooms is perfectly complimented by side sea views on top of the landscaped gardens or relaxing views of the Aegean. Feature windows and a furnished private balcony provide guests with seamless indoor-outdoor living in the main building. 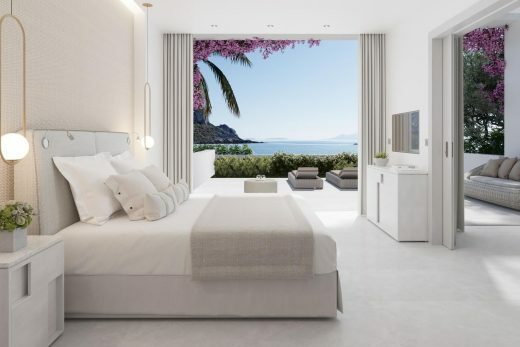 Beautifully spacious and furnished in contemporary Mediterranean style, these elegant suites provide perfectly for two adults and two children. The panoramic windows and fully furnished balconies offer views over the dazzling Aegean Sea. Beautifully spacious and furnished in contemporary Mediterranean style, these elegant suites provide perfectly for two adults and two children. 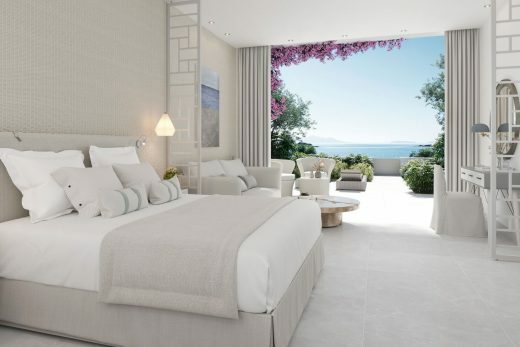 The panoramic windows and fully furnished private garden offer views over the dazzling Aegean Sea or the verdant gardens. These ultra-spacious and elegant bungalow-style suites come with a separate bedroom and lounge for extra privacy. Panoramic windows and a private garden offer views over the beautiful Aegean. The perfect space for two adults and three children. Seamless indoor-outdoor living comes to life in these spacious suites with private garden. Perfect for two adults and two children, each suite combines bedroom and living room in one contemporary open plan design, complete with sofa bed and dining area. Offering gorgeous pool or sea views. These luxurious, spacious family suites offer a separate bedroom and lounge for extra privacy. Panoramic windows offer relaxing sea views whilst the suite’s fully furnished balcony offers ample room for sunbathing and al fresco relaxation. Each suite comfortably accommodates two adults and three children. Located tantalisingly close to the beach, these spacious suites with separate bedroom and lounge come with a verdant private garden, fully furnished with sun loungers to enjoy the sea views. With an impressive private pool and fabulous location, these elegant and luxuriously spacious suites offer spectacular views. With a separate bedroom and lounge for extra privacy and a spacious sun terrace furnished with sun loungers. 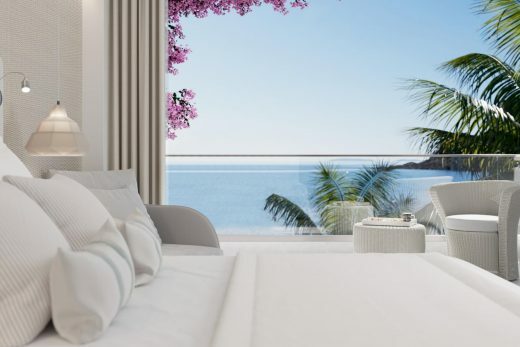 Set in an exclusive beachfront location with a furnished private garden these ultra-spacious suites feature two separate bedrooms and a lounge for a high level of privacy. These privileged suites comfortably accommodate up to six. 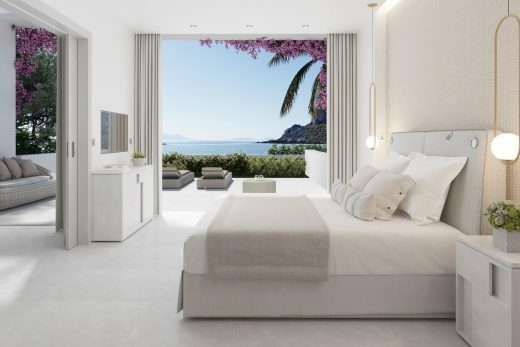 Set in an exclusive location, with an impressive private pool, these luxurious, ultra-spacious family suites offer extensive views over the Aegean. Each suite features two separate bedrooms and a lounge for a high degree of privacy.